Californian bungalow renovation under construction. Double sliding doors to entertaining deck and garden. 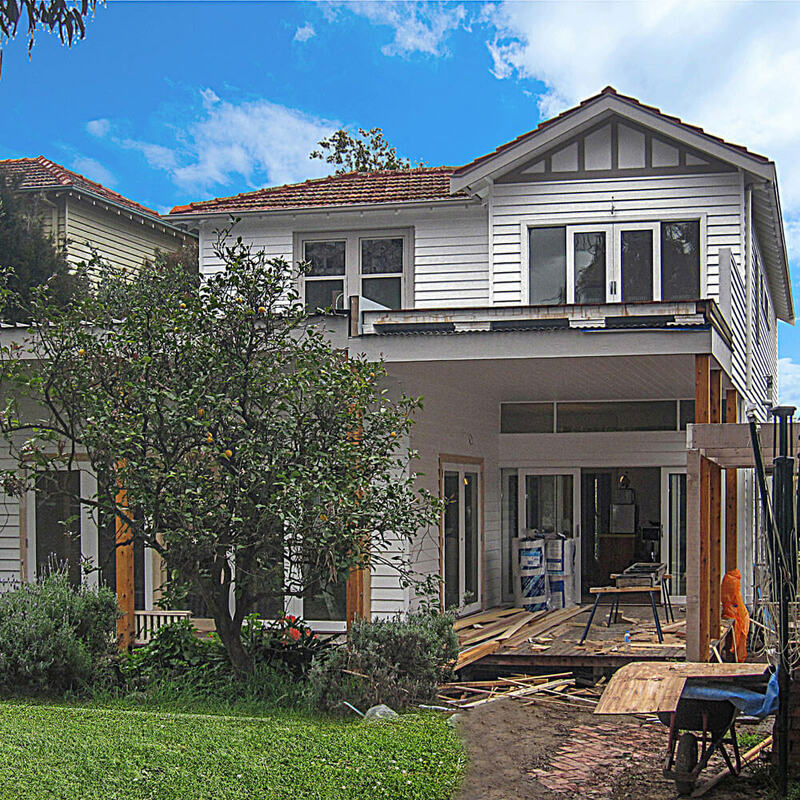 Camberwell House Renovation. Original second hand windows with lead light. A Californian bungalow renovation was on our Clients’ horizon. In particular, they wanted a sustainable home. Indeed, they loved their existing bungalow home in Camberwell. What they particularly liked about their Californian Bungalow was the look of their home. Furthermore, they were keen to use second-hand windows and doors in their renovation. What makes a house a bungalow? Let’s start with what is a bungalow. Interestingly, derivation of the word bungalow comes from the Hindi word ‘Bangla’. So a Bangla means a house in the Indian Bengal Style. What’s the difference between a house and a bungalow? Depending on where you are in the world, the word bungalow has different meanings. In Australia, the Californian bungalow home style is a variation of the house forms that sprang out of the United States. 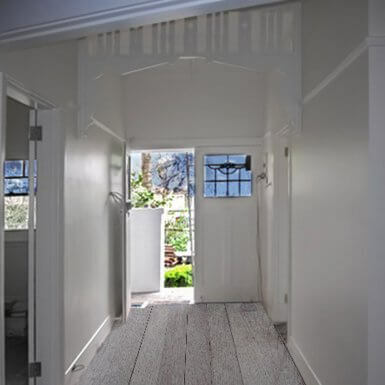 A standard feature in a Californian bungalow house is a verandah. They can be a single storey or a one-and-a-half storey high, detached house. 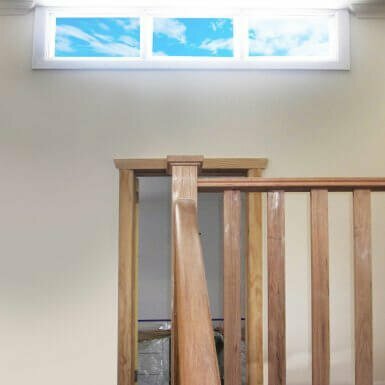 So a Californian bungalow might have a room built into the roof space with dormer windows. Other typical features include sloping roofs with eaves. And unenclosed rafters along with wood shingles or stucco exteriors. Many Californian bungalows feature brick chimneys and a partial-width front porch. 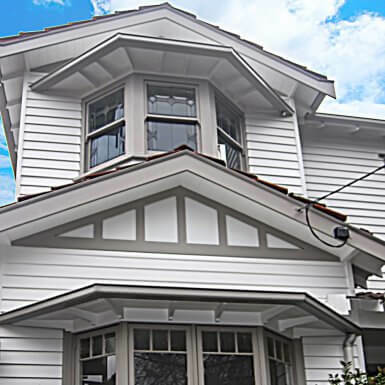 The 1910s saw the first Californian style houses built in Australia. During this time, Hollywood was on the rise. Popular American culture featured in Hollywood films. And in Australia, U.S. architectural magazines found their way into our homes. 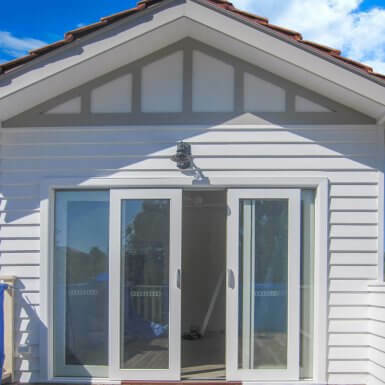 Before the introduction of the Californian bungalow style in Australia, housing took inspiration from British house style. What the Clients didn’t like about their home was the feel of it. Mainly, that they found their home dark and dim with not enough daylight. Life was very cramped living in their original Californian bungalow. Clients found that there was not enough space to put things. And they felt crowded living in their Californian bungalow home. Plus their Californian bungalow required repair work. Along with renovation works, they had water and mould issues. Their lounge room ceiling was water damaged. And they didn’t know if they could keep the plaster ceiling rose in this room. Besides this, there was mould on the walls of the bathroom. Their kitchen was small and more of a walk through-room than a proper kitchen. Furthermore, most of the space in the kitchen was primarily taken up by the large fireplace. Without a doubt, their way to the back yard was awkward. You had to go through a small laundry to get to the outside. Furthermore, they found that their children’s rooms got way too hot in summer. Also, their front entrance was dark and uninviting. But they enjoyed some of the original features of the house. 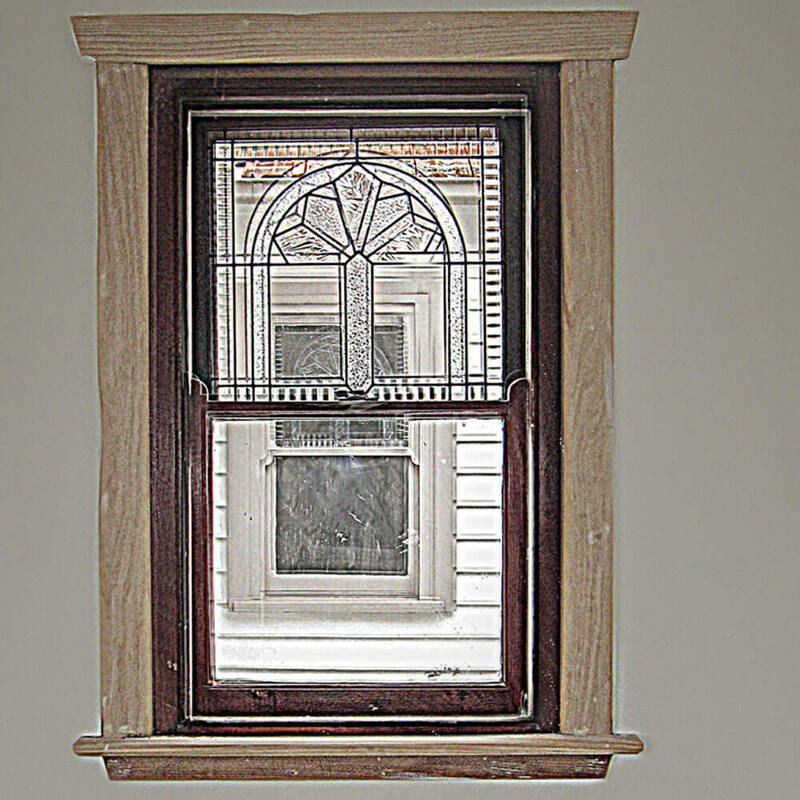 In particular, the beautiful timber fretwork and the bay windows from this period. Primarily, they liked the aesthetic of the home. Indeed, they had their eyes on some tall narrow second-hand leadlight windows. 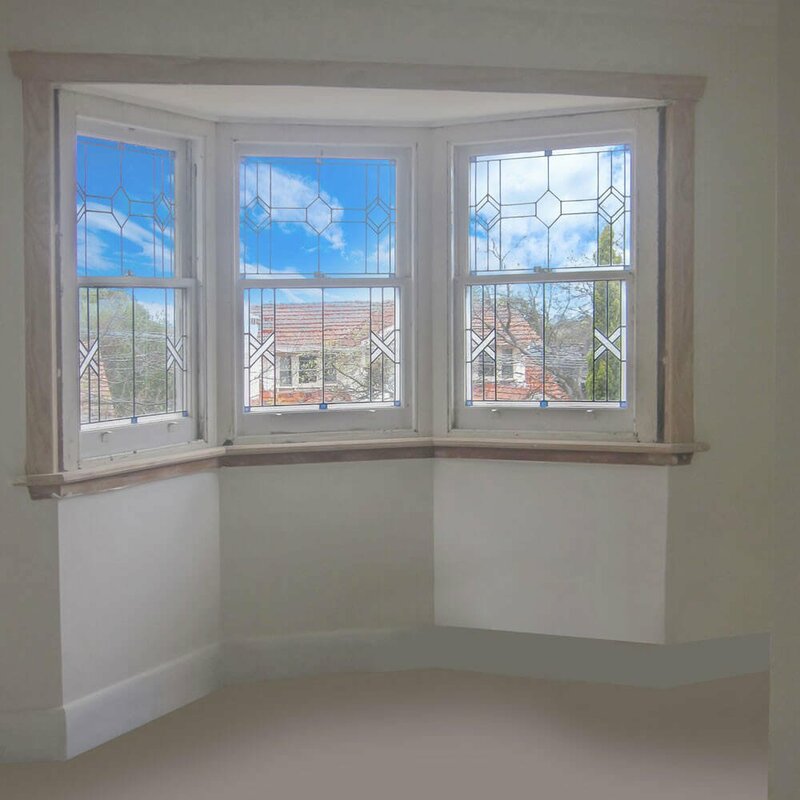 The Clients thought these tall leadlight windows would look splendid in their new dining area. They tried to make their home more livable as their parents were getting older. And they wanted to make sure that there was room for their parents in their new home. So with their renovation, making it easy to get around for older adults was important. They were keen on having a high performing sustainable home, and that was high on their new home agenda. We redesigned the floor plan so that there was easy access throughout the house. The new layout positioned the new kitchen and living areas on the north and warmer side of the home. With a modern kitchen and dining room in an open and bright inviting space. Connecting central opening glass sliding doors make it easy to get to their garden. And there is an entertainment lounge off the dining room. A side hatch in the lounge to the kitchen made it simple to access the kitchen. Life became so much easier. 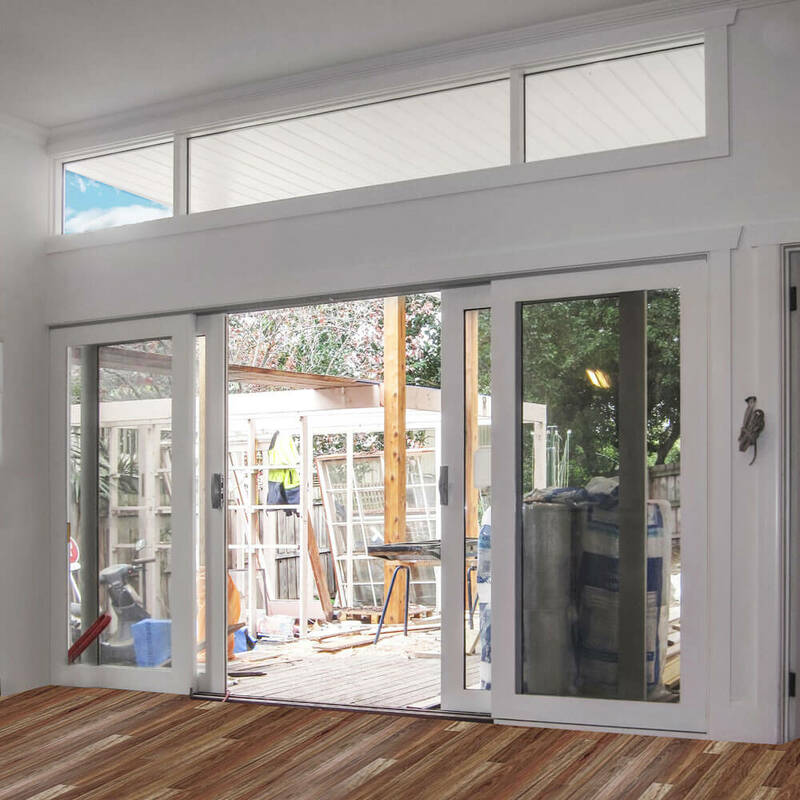 Large sliding doors in their living areas make it easy to get to the deck. And in doing so, creates an inviting space for people to enjoy on warm summer nights. The result of renovating their home is a completely transformation. There are private living spaces for their two teenage daughters. Also, the parents have a private ensuite and robe. Along with a spacious laundry utilizing all space under the stair for storage. Placing the new laundry and powder room in the same area as the original kitchen. By locating the utility rooms in this area allowed the builder to use existing plumbing. 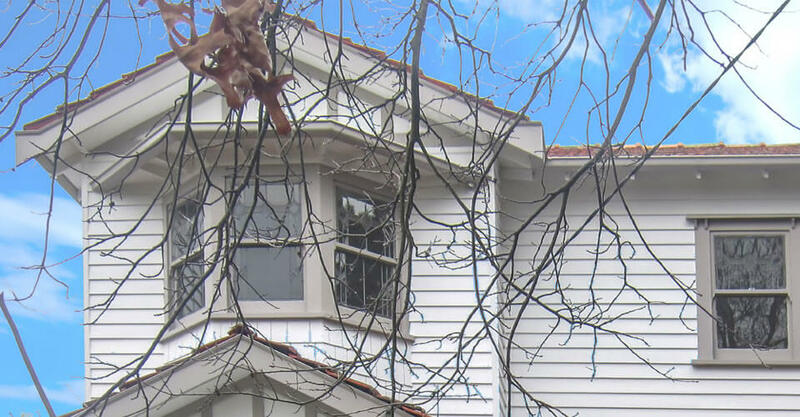 The Clients sourced second-hand double hung windows and bay windows for their renovation. By using second-hand windows helps to maintain the aesthetic and character of the home. The glass sliding doors provide a physical and visual connection to the garden. And the new outdoor living areas includes a first-floor roof garden and deck. The transformation of this existing California bungalow home is complete. It is now a light bright and delightful home with garden views. And decorative features enhance the character of the house throughout. Our clients now live the sustainable lifestyle they wanted. And do so in a beautiful modern and contemporary home with all the mod cons they need. In a home they love. Camberwell location is in the eastern suburbs of Melbourne. It is in a temperate dry climate zone. The front of the house faces south. And the living areas in the Californian Bungalow renovation orientate to the north. There was no sun protection to the west side of the original Californian bungalow. And the site is heavily treed on the east boundary. Providing extra daylight to the house was significant to the Clients. By placing a high window at the top of the stairs and above the bathroom roof allowed light to stream into the home. By designing the Californian bungalow for daylight throughout, fully transforms the house into a light bright and delightful home. Rooms have multi-use to make the most use of the home. Designing flexibility of room use into the house plan. This flexibility means that areas in the home can be opened up. And in opening up these rooms you increase room volume during summer. Dispersing hot air throughout the house. At the same time, allowing for these rooms to be closed down in winter. This is to reduce the room volume requiring warming in winter. High ceilings in part of the house facilitated exhausting hot air in summer. Ceiling fans moved this warmed air downwards when needed in winter. Living areas orientated towards the north, including the roof garden and entertainment deck. Utility areas grouped on the west side of the house and are shaded by the carport. The carport shades from the afternoon summer sun. Along with the addition of external blinds to the first-floor living room. And the west windows fully shaded and protected from the summer sun. When you are renovating this is the opportunity to upgrade your insulation. Insulation provides a good return on your investment. If you install insulation, you can expect to have this cost paid off within a couple of years. Paying the price of insulation with cost savings from lower electricity bills. High levels of insulation improved the energy efficiency of the Californian bungalow renovation. It was possible to upgrade the wall insulation to R2.5 where before there was no insulation. There are high levels of the ceiling and wall insulation. 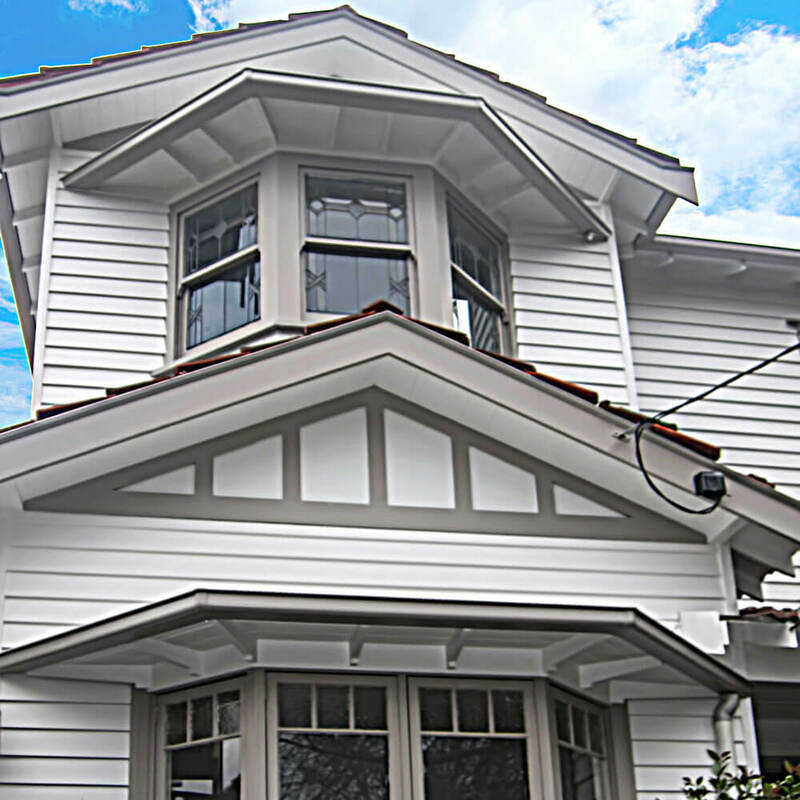 The Californian Bungalow Renovation has High efficiency double glazed windows. And for the installed original secondhand windows, heavy drapes insulate. 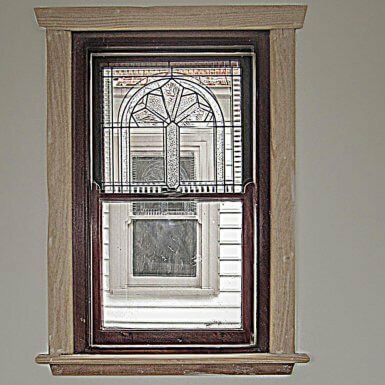 Window positions enhance cross ventilation throughout the house. The design of the room layout allows unobstructed air flow throughout the home. And breathable building membrane wraps the house. This membrane stops air leakage and infiltration. Keeping the look of the original Californian bungalow was essential to the Clients. Storing materials removed during demolition on site. Original roof tiles are now on the first-floor roof. By retaining what was in good working order. Such as the existing metal deck roofing to the earlier additions at the rear of the house. A roof garden covers part of this roof. By reusing the original weatherboards kept the Californian bungalow house authentic. The renovation plan included reusing doors, architraves and skirting boards removed during demolition. And new materials were matched to the original building material. Recycled timber handrails installed matched the front verandah handrail. And reclaimed timber added to the north deck.